What Makes Hawaii Holidays Special? White sand beaches and warm temperatures make for the perfect place to enjoy a holiday in Hawaii. Finding the best prices for airfare, hotels, car rentals and activities can be sometimes be daunting. But having your vacation on any of Hawaii’s national or state holidays can sometimes be challenging. New Year’s – January 1. Martin Luther King, Jr. Day – third Monday in January. Presidents’ Day – third Monday in February. Prince Jonah Kuhio Kalanianaole Day – March 26. Good Friday – Friday before Easter. Memorial Day – last Monday in May. King Kamehameha Day – June 11. Statehood Day – third Friday in August. Labor Day – first Monday in September. General Election Day – first Tuesday in November following the first Monday of even numbered years. Thanksgiving – fourth Thursday in November. Sometimes travel cost during these times can be more expensive than usual. For example, Thanksgiving is one of the most expensive times of the year to travel to Hawaii. Another costly travel time is during Christmas and New Years. In addition to these three periods, Hawaii has the same national holidays celebrated throughout America. Examples are Independence Day, Labor Day, Memorial Day, Martin Luther King Day and Presidents Day. Generally, the cost of airfare is somewhat higher as more people tend to travel during these times. But there are also holidays unique to Hawaii. Hawaii is one of handful of states that has Good Friday as a holiday. March 26 is Kuhio Day. It honors the life and contributions of Hawaii’s most beloved monarch. June 11 is Kamehameha Day and commemorates the legacy of Hawaii’s greatest king. 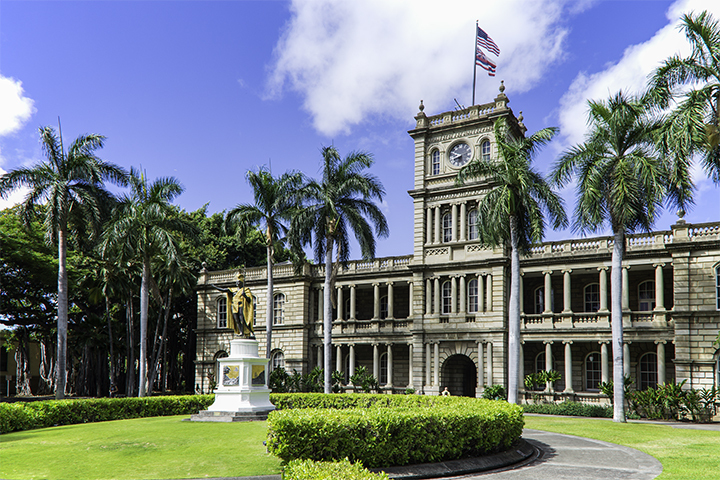 Hawaii also has the third Friday in August as a holiday in the form of Hawaii Statehood Day. It celebrates the time when Hawaii officially became a State in 1959. 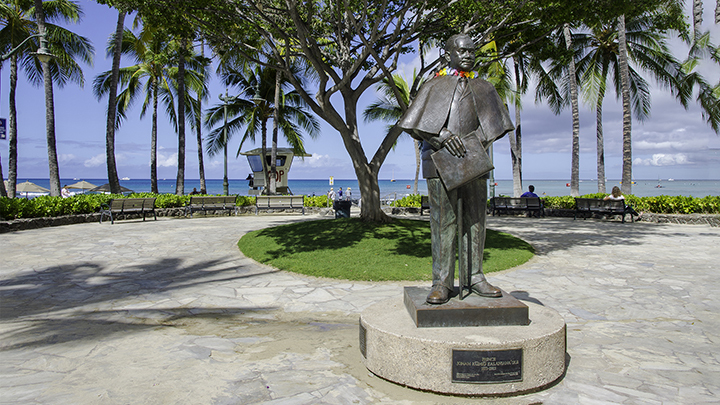 Statue of Prince Kuhio in Waikiki. Hawaii commemorates the birthday of Prince Jonah Kūhiō Kalanianaʻole on Kuhio Day. He was certainly one of the most popular members of Hawaiian royalty. The people of Hawaii nicknamed him the “citizen prince” because of his efforts to defend the Hawaiian kingdom as well as his advocacy of Hawaii as a Territorial Delegate to Congress. Hawaii’s last prince led a very colorful life. He was actually imprisoned for his role in a revolt against the Hawaiian Republic. The new republic was formed after the overthrow of the monarchy. After his release, he fought in the British Army in the Boer Wars in South Africa. He also had a reputation of a brawler with stories of him knocking people out for making racist remarks. He was the only member of congress of Hawaiian royalty. Perhaps his most important contribution was his efforts in the Hawaiian Homes Commission Act of 1921. He convinced Congress to set aside lands in Hawaii for housing native Hawaiians. The State Department of Hawaiian Home Lands still administers this program today. Hawaii honors its most influential Hawaiian monarch, King Kamehameha I, every June 11 of each year. Hawaii remembers him for unifying all of the Hawaiian Islands under his rule. He was able to accomplish this through warfare as well as through skillful political negotiations. By doing so, he became the founder and first ruler of the Kingdom of Hawaii. Historians believe the unification of Hawaii in the early 1800s was important in two ways. First, it was a significant accomplishment in and of itself. But also some feel, without a unifying leader, the Hawaiian Islands might have been torn apart by competing foreign interests. The State of Hawaii celebrates this occasion on the third Friday in August. Hawaii officially became the 50th State of the United States on August 21, 1959. This culminated 40 years of efforts for those who lobbied for Hawaii’s statehood. Prince Kuhio, as a Territorial Delegate, had first proposed this idea to Congress back in 1919. Planning to travel to Hawaii during any of these Hawaii holidays? If so, Panda Travel ® can create a travel package that suits you and your budget. We can also advise of any special activities held during any of these Hawaii holidays. Panda Travel ® is a full-service Hawaii travel agency with more than 35 years of experience. We can put together individualized travel package for all kinds of Hawaiian holidays. And we want to help you too. Over the years, Panda Travel ® has established solid relationships with Hawaii travel suppliers. This includes local hotels, resorts, airlines, car rental companies and activity providers. Through our strong connections with these businesses, we are able to provide more affordable deals for your Hawaiian holiday. Plus, the more you bundle travel components into a package, the more than you can save. With our quick-search tool, Panda Travel ® has made it even easier to find deals on our website. This includes everything you need to make your trip to Hawaii a successful one. These are items like airfare, rental cars, hotels and activities. And you can book all of of them with a few simple clicks. Looking for more information to planning your holiday in Hawaii? If so, give us a call via our toll-free phone number at (800) 303-6702. Our travel agents are locally-based. And they will plan your vacation with first-hand experience on the best things to see and do in the Aloha State.